Castle Conway (formerly Killorglin Castle), Killorglin, Co.Kerry. Not to be confused with Conway or Conwy Castle in Wales. 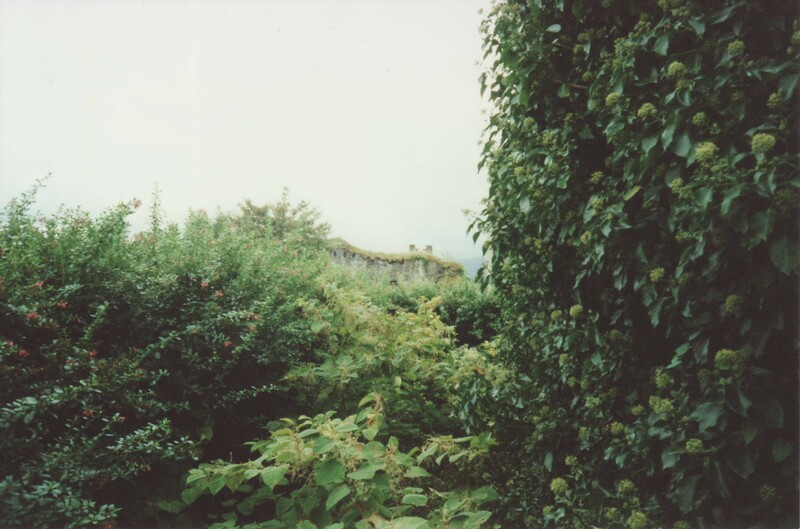 History of Killorglin, Kieran Foley, 1988, [KCL] RR. "An account by J. Windele of excursions in Kerry in 1826-7, 1848" (Castle Conway in 1848), RIA, Ms.12 C. 11. 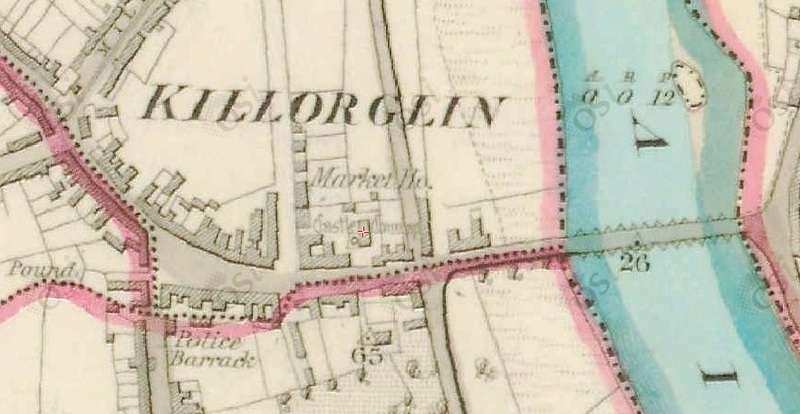 Castle Conway (red cross) in Killorglin, on 1829 to 1842 map. Originally "Killorglin Castle", built 1215 by Maurice Fitzgerald. Granted 1587 (confirmed 1592) to Capt. Jenkin Conway. His son Jenkin Conway built a new castle there after 1613 and re-named it "Castle Conway". Castle Conway passed by marriage to Robert Blennerhassett around 1660. 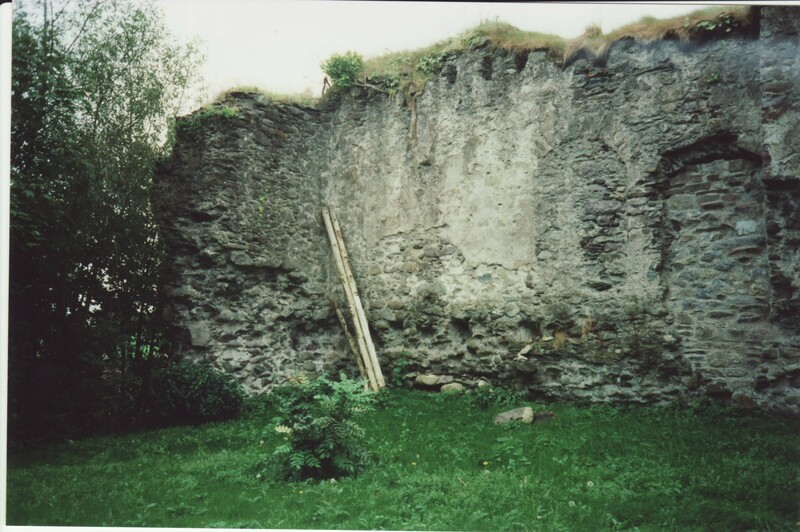 The old castle was in ruins as at 1682. Avice Conway was buried 1683 in the Chapel at Castle Conway. The Blennerhassetts, probably in the time of John Blennerhassett, "Black Jack" (1690s to 1730s) built a fine new residence there. 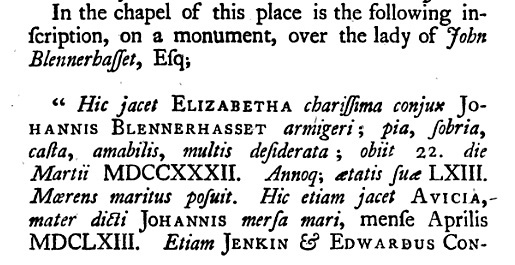 Elizabeth Cross was buried 1732 in the Chapel at Castle Conway. Castle Conway was inherited by Conway Blennerhassett. Page 70 of [Smith, 1756] says Killorglin church was then "in ruins". Castle Conway was inherited by Harman Blennerhassett 1792. He sold it to 1st Baron Ventry 1795. Still intact on 1829 to 1842 map. Gone by time of 1887 to 1913 map. 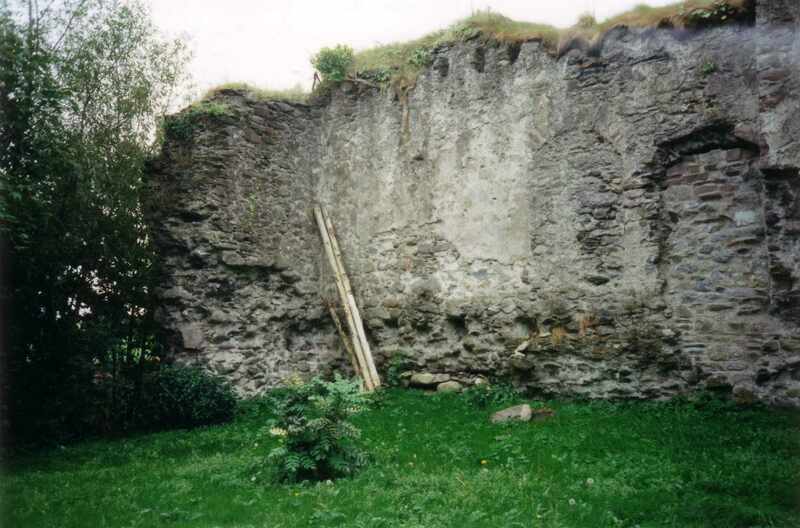 A ruined wall (on the S side) survives today, on high ground, hidden from the street behind buildings. 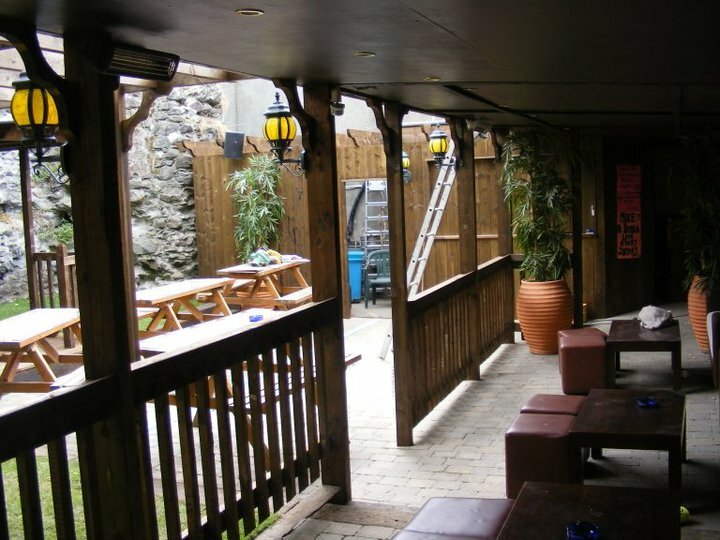 It is accessible through Kingston's bar on Market St. See street view. 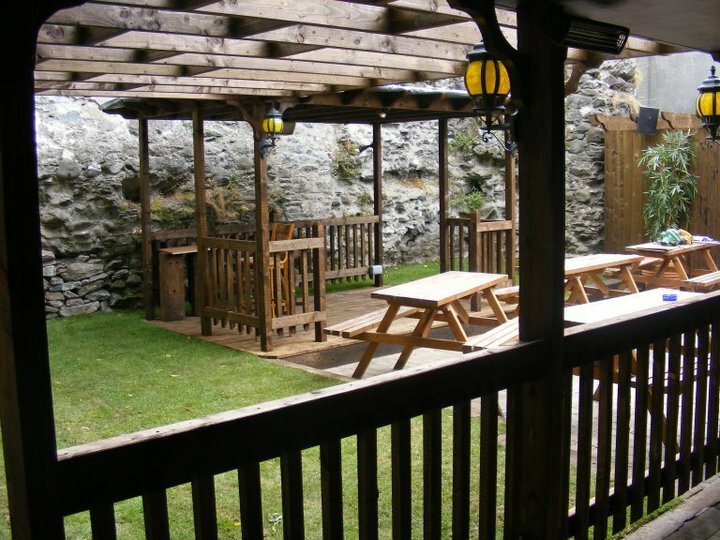 In 2010 the area in front of the wall (to the N side) opened as the beer garden and live music venue of Kingston's bar. 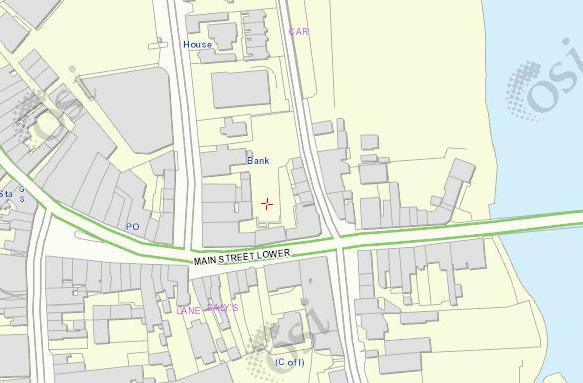 Castle Conway still exists on the map of [Griffiths Valuation]. 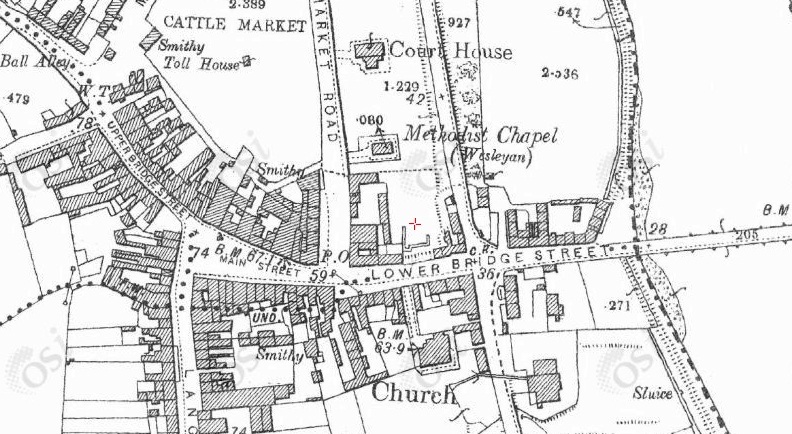 By the time of the 1887 to 1913 map, Castle Conway is gone (red cross) and all that survives is a ruined wall (on the S side). "Church" is the Church of Ireland church built 1816. On the modern map slightly less survives. See 2000 photo from the S side. See street view from the S side. The remaining ruined wall of Castle Conway, from a distance. Photo 2000. See larger and full size. The remaining ruined wall of Castle Conway. Photo 2000. See larger and full size. See other scan. 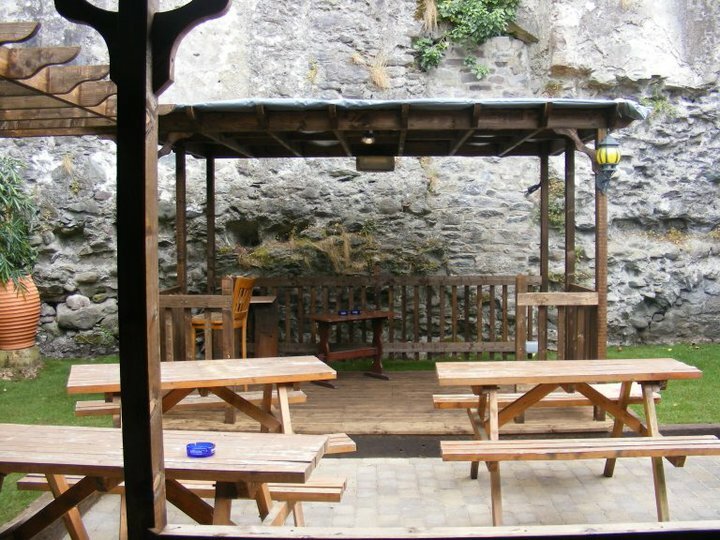 The beer garden, Kingston's bar, Killorglin, incorporates as a backdrop the surviving wall of Castle Conway. Photos from 2010 album at Kingston's bar on Facebook. A marble memorial in memory of Conway and Blennerhassett was erected in 1732 in the chapel at Castle Conway. The memorial to Elizabeth Cross was erected by her husband John Blennerhassett, "Black Jack" of Castle Conway. The memorial is now vanished. [Smith, 1756] just says "In the chapel of this place", talking about "Kilorglin, or Castle-Conway". Bill Jehan shows that one transcript of "Black Jack's Book" has him referring to the monument being "in my Chapel at Killorglin", which suggests it was a private chapel at Castle Conway. 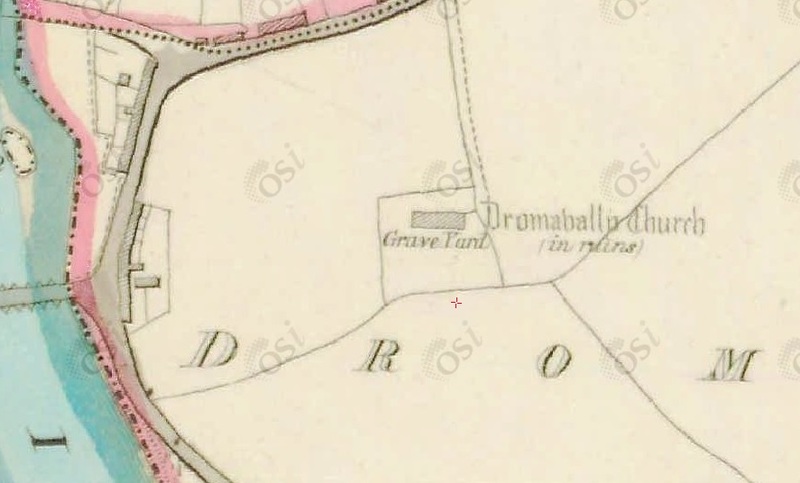 There was a vault of Blennerhassett of Castle Conway at the old church at Dromavally on the E side of Killorglin town, so this could be the place. Castle Conway on p.148 of [Smith, 1756]. Transcription of the Conway-Blennerhassett tomb. 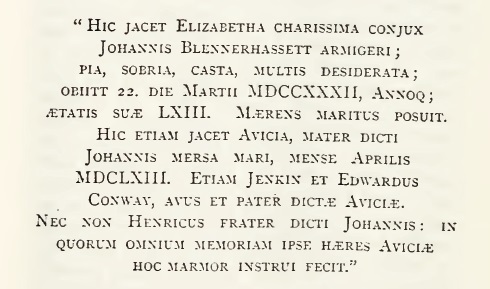 Transcription of the memorial, in the transcript of "Black Jack's Book", c.1737, printed on p.55 of [Hickson, 1872]. "Here lies Elizabeth dearest wife of John Blennerhassett gentleman; pious, sober, chaste, kind, missed by many; died 22 March 1732; in her 63rd year. Her grieving husband buried her. Here also lies Avice, mother of said John, who was drowned at sea in April 1683." [NOT 1663] "Also, Jenkin and Edward Conway, grandfather and father of said Avice. As well as Henry the brother of said John: in the memory of all of these the heir himself of Avice had this marble made". 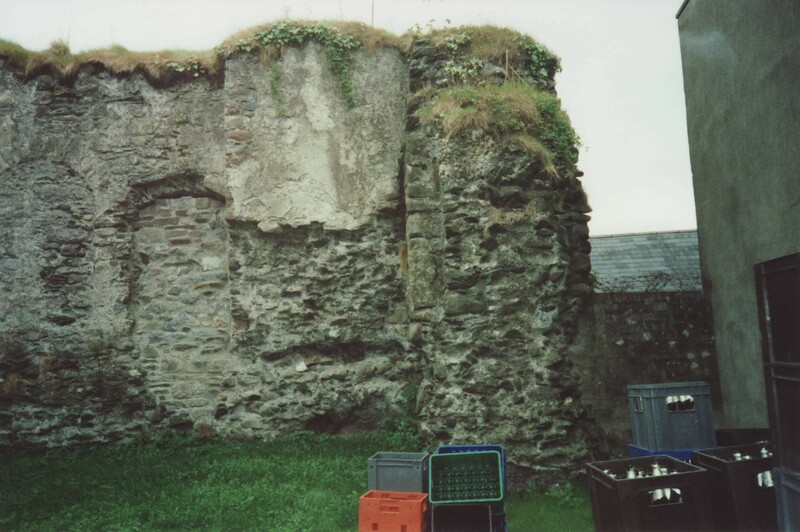 KILLORGLIN in [Ardfert and Aghadoe Clergy] says: "The old Church stood at Dungeel, and there was also an old Church at Dromavally. The modern Church was built in 1816". Dungeel is some distance E of Killorglin. See map. Dromavally is close to Killorglin, on the E side. See below. 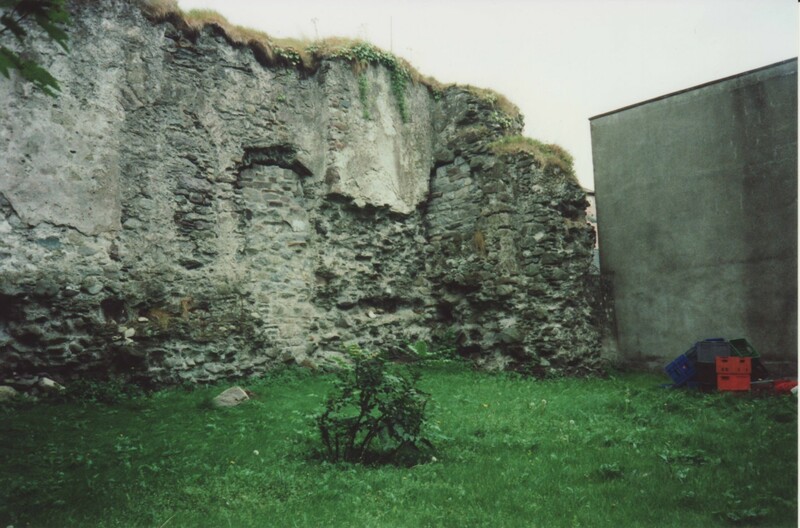 The 1816 church was built in Killorglin town just opposite Castle Conway. See the maps above. 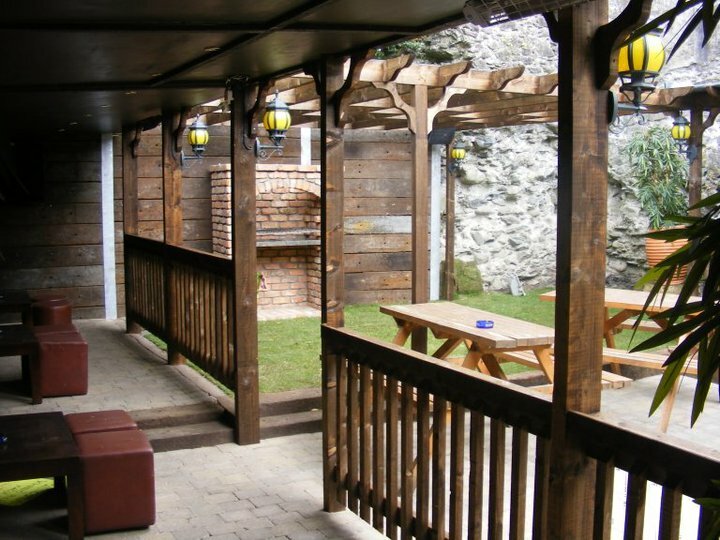 It is now a restaurant, Sol y Sombra Tapas Bar. See street view of entrance. See photo. 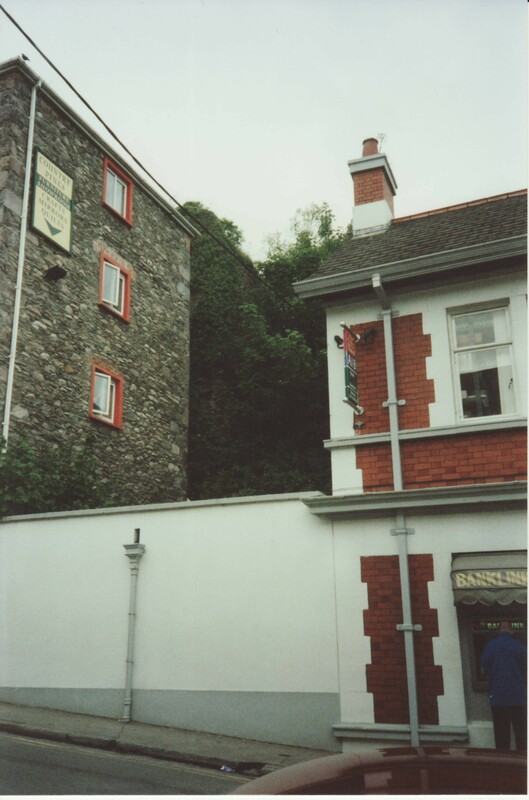 There is a new (1997) church elsewhere in Killorglin town, St.Michael's church. See street view. 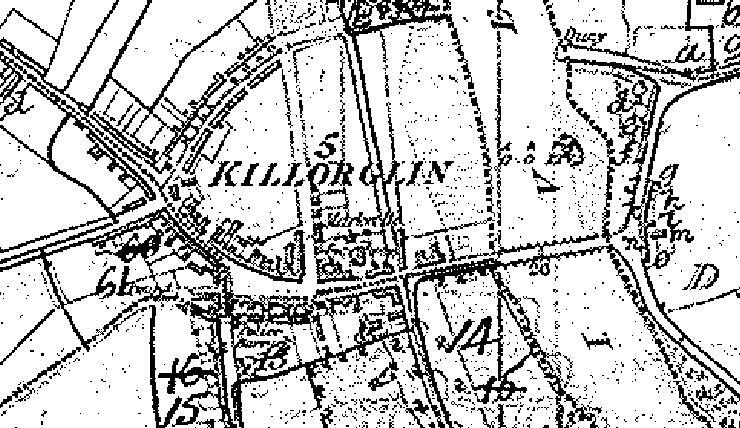 Dromavally, Killorglin par, Co.Kerry, on 1829 to 1842 map. This is on E side of Killorglin town. See modern street view of entrance to graveyard. [Crisp, 1904] says that Elizabeth Blennerhassett, dau of Rev. John Blennerhassett of the Castle Conway branch, is buried (post-1806, maybe 1827) "in the Blennerhassett vault at Drumavalla, Co.Kerry". This indicates that her ancestors, the Blennerhassett of Castle Conway branch, are buried here.